Catherine de Medici had been born 8 years earlier to the grandson of Lorenzo the Magnificent. She had become an orphan at the age of 3, when both of her parents were stricken by the fever. As a result, she was raised by her grandmother Alfonsina, and when Alfonsina died she was given to Lorenzo's surviving great-aunt Lucrezia and her aunt Clarice. It was Clarice who would save Catherine from the invading mob in 1527. Clarice would die shortly afterward, and the new republican government in Florence demanded the return of Catherine. Catherine would be held hostage in a convent for the next three years under a strict regiment, in less than ideal conditions. Fortunately, the Medici would win their final battle in 1530, and she would emerge a celebrity. A year later, she was married to the second son of the French ruler, King Francis I. Her cousin, Pope Clement I, accompanied her to the marriage. At the time, both bride and groom were 14 years old. Catherine was described as penniless, frail, thin, without delicate features, and she had what was the family trait, bulging eyes. She would have 10 children, 3 kings of France, 1 king of Poland, and a queen of Navarre, which was a record for a French monarch. In 1547, Henry became King Henry II. Over time he began to value Catherine's opinion on important matters. Then, in 1569, Henry was killed in a jousting accident, and their oldest son would become King Francis II. King Francis was very sickly, and he would be dead in a year. Catherine was 40 years old at this time, and the most powerful person in France. 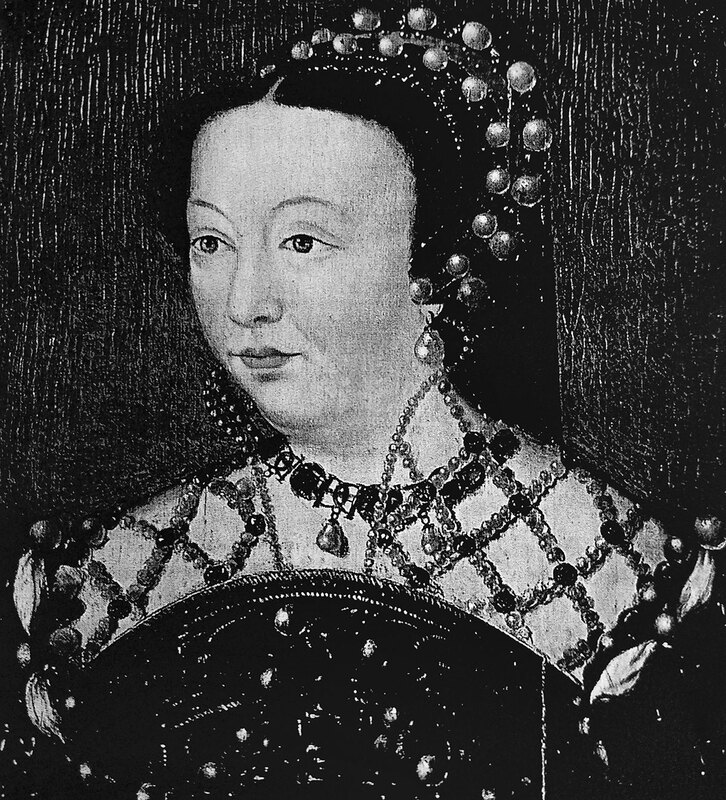 During the rule of Francis, and the 14 year reign of his brother Charles IX, Catherine controlled the policy of the crown. Her decisions were final. She would rule as regent for 30 years, although she would have less influence under the reign of her son King Henry III. During her 30 year rule constant civil war thrived between the Catholics and the Protestants. They each believed that the other polluted the earth. During her rule Catherine made several serious mistakes. The biggest one was not allowing King Henry III to attack her enemy the Duke of Guise. Not attacking was the beginning the of the decline of the de Medici/Valois family line. On Christmas Day in 1588, King Henry III invited Guise to be his guest at his castle. Guise took it as a gesture of friendship. Instead, Henry had Guise murdered in the room directly above Catherine’s. Catherine was immediately horrified because Guise was the leader of the Catholics, and she knew they would kill her family members, and they did. Then, in a final act to promote reconciliation, she went out in the bitter cold to make amends with an imprisoned Catholic leader, shortly afterward she developed pneumonia and died.